It was, there can be no doubt, a major feat in civil engineering for its time. Running along the Hudson River in the highlands of Storm King Mountain, the Storm King Highway — a roughly three-mile-long segment of road between the towns of Cornwall-on-Hudson and Highlands in Orange County, New York — wasn’t an easy build. Now that’s a neat little story — and one a genealogist might want to add to a family history if we had folks from those areas in the years leading up to and just after World War I. But how would we know, today, that this was such a big deal for the people of that time and place? Of course, there’s more to the story. And doing nothing but reading the law books isn’t going to tell the whole tale. As would any good genealogist, we’d go to other sources for the whole picture, including the newspapers of the day. Definite announcement has been made at Albany that the Storm King highway which was to have been opened for traffic this summer, will not be opened until next year. Because a contract for a piece of road connecting the new highway with the Cornwall road is to be let soon, it would be impossible for throngs attending the proposed opening celebration to even see the Storm King highway. There is no possible detour at that spot. CORNWALL, N.Y., Sept. 24–For the first time since it was completed the new Storm King State Highway, which was blasted through the cliffs on the face of Storm King Mountain in Cornwall, was opened to the public today and hundreds of automobiles passed over it in a few hours. The rush of automobilists who wished to ride over the fine boulevard on the opening day was so great that Chief of Police William Fee of the Palisades Interstate Park force assigned four patrolmen to regulate traffic. It’s a fun story, for sure… and, of course, like most stories, not one that can be told only from the law books. But this genealogist, for one, wouldn’t have known there was a story there at all without reading the law books. 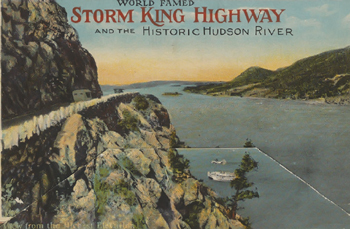 Image: Storm King Highway and the historic Hudson River (Newburgh, N.Y. : J. Ruben, 19?? ); digital images, Internet Archive (http://www.archive.org : accessed 27 Apr 2016).